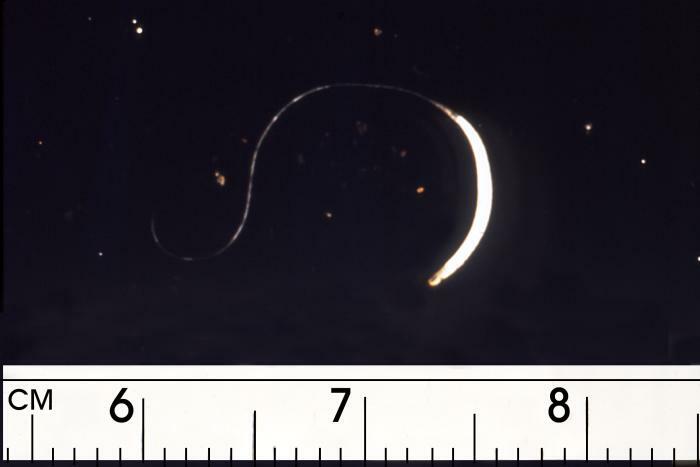 ID#:	414 Description:	This micrograph of an adult Trichuris female human whipworm, reveals that its size in centimeters is approximately 4cm. The female T. trichiura worms begin to oviposit in the cecum and ascending colon, 60 to 70 days after infection. Female worms in the cecum shed between 3,000 and 20,000 eggs per day. The life span of the adults is about 1 year.